Want to do something different for your next holiday? Book a room on a breathtaking river odyssey through Bengal and Assam. And see the East from a different perspective - via its two mighty rivers. 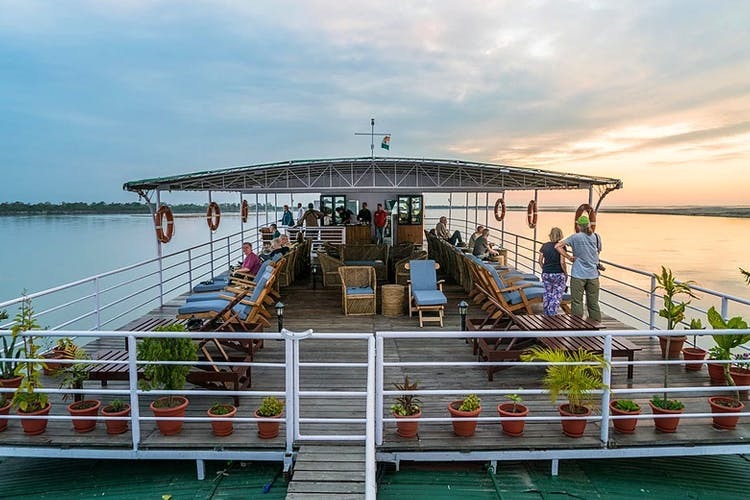 From Oja Pali to Rath Jatra – you can get a load of it all with a river cruising experience on a 12-cabin boat which navigates the mighty Brahmaputra and the Hooghly. The cruises are from July through the end of April, and every month there is a different sailing experience. From July to September, it sails only on the lower Ganges because the water levels are high so grounding is rare. And rural India looks its incomparable best in the lush and green wonderful clarity of light. Run by an Indo- British joint venture company, The Assam Bengal Navigation, they have become quite popular in India and abroad so you can expect an interesting mix of fellow passengers. On one cruise, we heard they had a writer and a photographer from Munich, a retired taxi driver from Monaco, and a conservation architect from London! They have three cruise ships and are among the largest and most experienced operators on Indian rivers. All their vessels have comfortable saloon and bar areas, dining room and sundecks. Expect your cabins to have AC and bamboo-panels and small balconies or French windows with cane sofas and chairs. The food is a mix of local and Continental cuisines. During October to December, you can experience the Brahmaputra cruises and tea gardens. If you dislike heat then January to February is the best time to climb aboard. Hop on during March and April to see the best of wildlife in Assam.